A few weeks ago one of our staff members got to hear how God used one of our bands from back in the 70�s, Armageddon, to change her life. We thought you’d be encouraged to read her story in her own words! It was July 7, 1970 at Downey High School (in California) and a couple of friends had invited me to hear a heavy rock band. 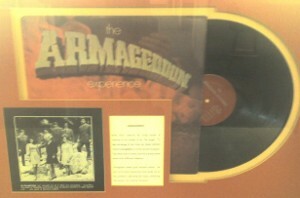 (I don’t remember the name of the [Campus Crusade] band, it might have been “Armageddon”.? All I remember is that I liked them or I wouldn’t have stayed around.)? The music was good, but really loud so I went outside to sit on a table in the quad. Even out there I could hear the music and speaker, but at least I was alone and could think.? Crowds were too much for me at the time. I’d done quite a bit of drugs and was a little paranoid. While I was sitting there a guy with long hair came up to me and said, “You want love don’t you?”? I wasn’t a virgin, and he was really good looking.? I thought he was trying to pick me up, so I said “YES!”? He asked me, “Did you know Jesus loves you?”? I remember my heart came alive, and I started to cry. I said, “Yes, I know Jesus loves me, but I’m too far gone, too dirty.”? He just spoke what I had heard at church for years, but this time it went so deep and all the hurt and self disgust came pouring out.? He gave me a tract with an address on the back, told me there was a Bible study the next night, and asked me to come. Isn�t that a beautiful story?? As you partner with us to serve Keynote, we trust that God continues to allow us reach out to even more people like Bev every day. We may not always know the “rest of the story” but we know God is at work. Thanks for being a part of Keynote’s ministry around the world. Speaking of ministering around the world, we have a lot going on overseas in October!? One team will be going to Panama to do communication and team training.? Blue Sky Nine will be heading to South Korea and Mongolia for 3 weeks to serve the ministries there.? And last but not least, Karl, Chris Zaugg (Director of Keynote), and a coworker are heading to Turkey for an Internet ministry conference from October 18-23! So there�s plenty going on to pray for, from health and safe travels to God directing every word and every note of these times and making them into �more than we can imagine�.? Thanks for praying! This entry was posted in Prayer Letters on October 3, 2009 by Liesl.